The personal blog of John Goodrich, including, but not limited to kaiju film and comics involving swamp creatures. I have repeatedly been told, by people I respect that there is no ladder. A new writer doesn't have to start down at the bottom of the pay heap and move upward. A story will go as far as it can, regardless of the author's previous credits. It's why $10 and $25 and even penny-a-word markets drive Brian (and Jack Haringa) insane. I believe them. So while I reject the ladder, I resolved to metaphor a different tool; the ratchet. I resolved not to sell any story for less than I had sold a previous story. And it worked. I've sold stories for increasing amounts of money, and now I've actually sold something for "pro," five cents a word. This leaves me with a small problem. Weird Tales only pays three cents a word, and I'd like to get in those pages. So, do I give up my dream of appearing in Weird Tales, or do I go against my self-imposed ratchet? I'm currently dodging this decision by writing a novel. I hope I'll have an answer in four months. I love Ancient Egypt. The culture was so different, the metaphysics so elaborate and the works of architecture so interesting. I love a culture that puts up a big stone stele every time Pharaoh does something noteworthy. And I love books that posit that Egyptian cosmology works. I own a fair number of books have taken Egyptian inspiration and applied them to already-existing game worlds and game systems. Hamunaptra sets 3rd edition (or is it 3.5? )D&D squarely in Ancient Egypt. It's full of nuggets of culture, including the calendar, notes on the gods and their domains, and creates a very different setting from traditional D&D. The box set, and it's been a long time since I bought a D&D box set, is a great alternative for anyone who doesn't want to follow the usual tropes of medieval fantasy. I like the authors' take on how to create atmosphere that feels different from the usual D&D. Great Sphinxes take the place of dragons, being the most terrifying creatures around. Like the best dragons, they are also accessible, ready to speak and bargain with petitioners. Of course, anyone who negotiates with an entity calling itself the Father of Terror had better watch what they say. 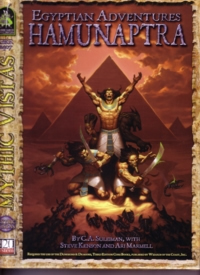 Hamunaptra is a must-read when I'm in the mood for some Mythic Egypt. Sadly, Wargods of Ægyptus is a wargame I will never be able to play. The game is too narrow to be of much interest to the small wargame community in Bennington. Which is a pity, I think it would be really cool to line up ranks of bronze-age children of the gods and let them fight it out. Crocodile Games did a very nice job with the sculpting of the pieces, but also differentiating the factions from each other. Each of the force follows a different Ægyptian god, both in physical form (usually an animal head) as well as in temperament. The crocodilian children of Sobek are brutal and effective fighters, where the feline Basti are decadent pleasure-seekers. Also, the mythic Ægyptian setting they created for the game is delightful. Who wouldn't want to investigate the Oasis of Tears, or the Shrine of the Dreaming Lords? 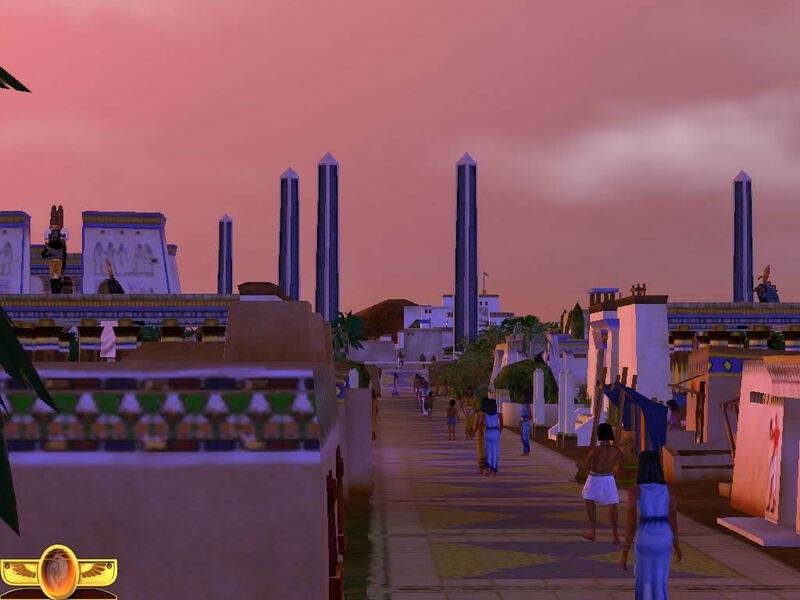 A marvelous game to read, which provides me with much Ægyptian inspiration. 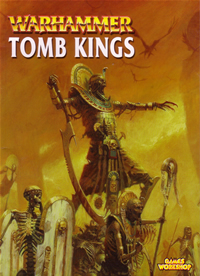 Games Workshop's Tomb Kings is a source book for playing an Egyptian-themes undead force in the Warhammer Fantasy Battles game. GW has a more developed world than Crocodile Games, and the Tomb kings seldom fight each other, usually challenging other, more traditional fantasy races such as the human knights, Orcs, or vampires. This gives them a very specific place in the world, and they are tied into the Old World's history. They are also all undead. 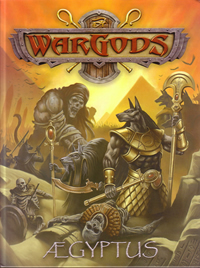 Wargods of Ægyptus gives the player the option of playing an undead force, but the Tomb Kings are all mummies and skeletons. The Tomb Kings are also more heavily magical than their Ægyptian counterparts, giving the forces a very different flavor. What started this all was Paizo's recent release of Osirion, Land of the Pharaohs. 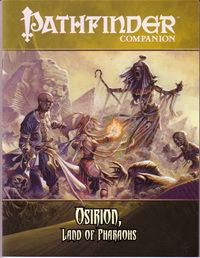 Osirion is an Egypt-analog in Paizo's Pathfinder campaign world. Unlike Hamunaptra, Osirion is part of a larger world that includes a great deal of medieval fantasy. It is part of a larger world, and has kept pace, culturally and technologically, with its medieval neighbors, although it retains many of the trappings of Egypt; a God-king called Pharaoh, pyramids, sphinxes, and a culture thousands of years old. It's also more heavily fantasy than Hamunaptra. The Pharaoh, for example, having the traditional pacts with clans of elementals, as well as demons and angels. The capital of Sothis is build around the carapace of an scarab beetle large enough that the Imperial Palace is contained in it. Osirion is also the setting for several Pathfinder adventures. Both Imprisoned with the Pharaohs and The Pact Stone Pyramid involve pyramids, and there's nothing wrong with that. Both are pretty entertaining reads. I like that there's a plethora of books that explore the themes and ideas presented by Mythic Egypt. I think game books are often overlooked as sources of inspiration. Setting books are nothing but ideas and background without any connecting narrative. Staring 2009 with a CRUNCH! There are certain media properties that I come back to, year after year. And I'm starting 2009 with a celebration of Godzilla. This is the first year that Toho might resume production of Godzilla films after a five year hiatus. 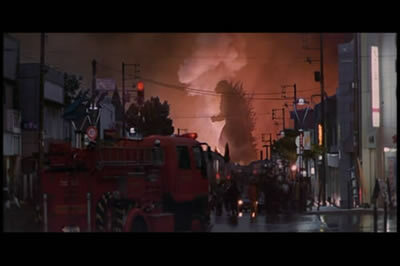 Godzilla films are, on the surface, about a gigantic, radioactive lizard stomping a city in Japan, traditionally Tokyo. 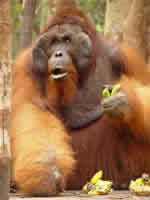 And there might be some conflict with another gigantic aberration of nature along the way. The metaphor in Godzilla has long been the the titanic forces unintentionally unleashed by our technology. In the original film, this was clearly nuclear testing, but that's gotten muddy in the subsequent films. The important part is Godzilla stomping on a city. I don't know if it's my closet misanthropy that loves seeing the works of man tumble in a fictional setting in a safely fictional setting. I don't like watching earthquake footage, although I could watch tornado videos all day. Destruction without killing, perhaps. For me, the best Godzilla sequences show Godzilla against the backdrop of reality. This was done best in Godzilla 2000, which gave a good sense of a huge radioactive lizard intruding into the real world. 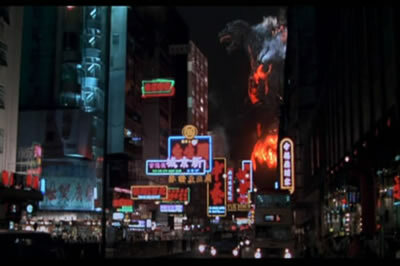 Likewise, Godzilla vs Destroyah, where Godzilla stomps on Hong Kong. He's inconsistently sized, but seeing the Big Guy with his nuclear heart overheating was a big shock. Unlike many G-fans, I don't like all Godzilla films. The one where he's upstaged by the giant, goofy-looking robot? I don't think so. The cheesy ones just don't appeal. My faves remain the original Godzilla, Godzilla 2000, and Godzilla vs Destroyah. I write horror, science fiction, fantasy, and literary criticism. I love kaiju films, comic-book swamp monsters, and semiotics. "In the Temple of Millions of Years"
"Nickolaus Passionate and the Children of Ereshkigal"
This blog is copyright 2017 by John Goodrich, Please ask before using and attribute properly. . Awesome Inc. theme. Powered by Blogger.